Most of us generally know what a ROM memory (Read Only Memory) is. It is so called “read-only” because it holds a persistent pattern of data that cannot be altered. The PROM, EPROM, EEPROM and flash are the types of ROM. 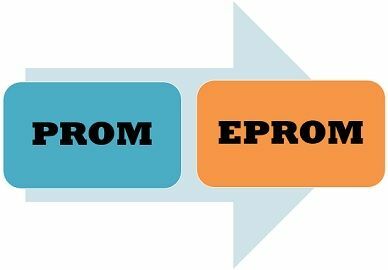 In this article, we will understand the difference between PROM and EPROM specifically. So, the main difference between PROM and EPROM is that the PROM can be programmed just once means that it can be written only one time whereas EPROM is erasable; hence it can be reprogrammed or rewritten. Unlike RAM, in ROM to retain the bit value or data in the memory the power source is not needed. Therefore, it is non-volatile in nature. The benefit of using ROM is that the data and program reside persistently in the main memory and doesn’t require to be loaded from the secondary storage devices. Basic The chip is one-time programmable only. The chip is reprogrammable. Cost Inexpensive Costly as compared to PROM. Construction PROM is encased in a plastic covering. A transparent quartz window covers EPROM. Storage endurance High Low comparatively. PROM (Programmable ROM) was intended to fulfil the need of a set of ROMs which can contain a particular memory content. The PROM memory is written only once and programmed electrically by the user at the time or after the original chip fabrication. The necessary content file is supplied by the user and inserted in the machine known as ROM programmer. There exist a fuse at each programmable connection and it is blown when the connection is not needed. In the construction of PROM the bipolar transistors are used which consumes high power but works speedily. It has high storing stability where the bits are not altered until the PROM is reconnected to the programmer and more fuses are blown. PROM is advantageous when produced in large scale and offer flexibility and convenience. EPROM expands to Erasable Programmable Read Only Memory, this type of ROM is read and written optically (electrically). To write an EPROM, its storage cells must remain in the same initial state. So, the packaged chip is shown to the ultraviolet radiations in order to erase the storage cells prior to performing the write operation. The erasure procedure is repeatedly performed and a one-time erasure can consume up to 20 mins. EPROM provides reduced storage permanence as compared to PROM because the EPROM is receptive to radiation and electric noise. The EPROM can be reprogrammed about thousand times after that it may become unreliable. The EPROM contains a quartz window which surpasses the UV light. In EPROM, the MOS transistor is used as a programmable component. The transistor composed of a floating gate (a small piece of polysilicon material) which is enclosed by an insulator. The channel produces negative charges between the source and drain and stores a logic 1. The high positive voltage at the gate drives negative charges to shift out of the channel and get trapped in the floating gate and stores the logic 0. When the floating gate surface is exposed to the UV radiations, it makes the negative charges to restore to the channel from the floating gate, thus restoring the logic 1. This phenomenon of programming is known as hot electron injection. The PROM chip is programmed for just one time. On the other hand, EPROM chip is reprogrammable. When it comes to cost the EPROM is more costly than the PROM. The EPROM is enclosed in a transparent quartz window so that the UV rays can transfer through it. As against, PROM is completely encased in a plastic cover. The PROM storage permanence is not affected by the radiation and electric noise but in EPROM the radiation and electric noise can affect the storage stability. However, EPROM can store the data for 10 years. The PROM is cheaper than EPROM but PROM can be programmed only one time while EPROM can be programmed multiple times but the chip has to be removed from the system in order to erase the data.